New to the forums, thought I'd say Hi! 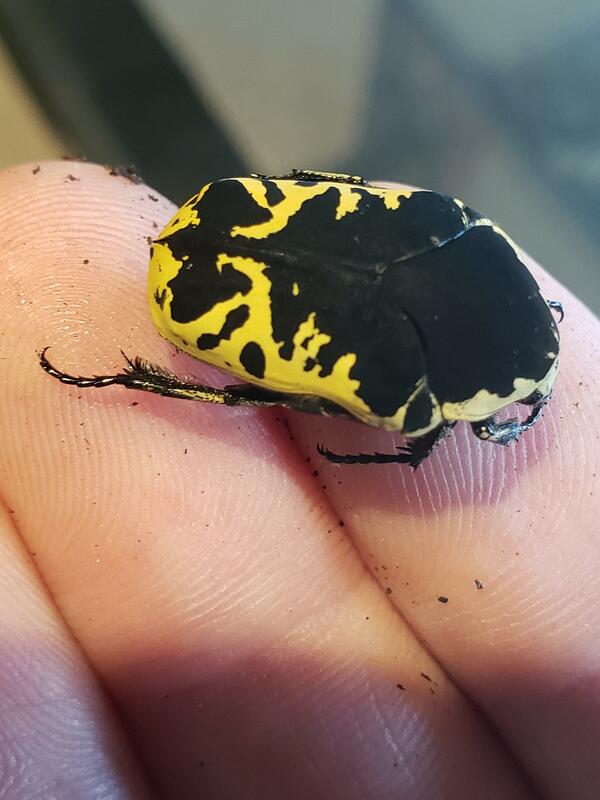 I am the primary invertebrate keeper at The Oregon Zoo, and am looking forwards to chatting with you all about all things beetles! I'm relatively new to beetle keeping, only getting into it in the last year-ish, so trying to soak it all up. Currently we're keeping Eleodes sp., Asbolus verrucosus, Gymnetis caseyi, Pachnoda flaviventris, Dicronorrhina derbyana, and Moneilema gigas as our beetle species in the Insect Zoo. We're in the process of updating our permit, so hopefully in the next year or two we'll be able to get in a several more species as well. Anyways, look forwards to chatting with you all! One of our many G. caseyi newly out and about! Well don't you just have everyone's dream job! Welcome! That's a beautiful beetle! Indeed I do. And thanks! G. caseyi was my intro in the beetle world, thankfully they're easy or I think it would have scared me out of it. But, after seeing a a bunch of little grubs turn into dirt balls and then awesome little black and yellow beetles, I got hooked really quickly. I think the best thing about working in the zoo though is having the APHIS permit and the support of a really good staff around us. It's going to hopefully let us work with some truly awesome species in the coming years. G. caseyi are a great starter beetle, pretty hard to screw anything up with them. You should be able to get some great stuff with that permit! Any plans to get particular species in the future? I'd really like to work with Chrysina gloriosa, as it's just such a pretty US native. I think we're also going to try and give one of the Sagra species a shot, especially if I can convince my hort dept. to let me culture some Kudzu vine. Other genera on my radar right now are some of the Mecynorrhina (so pretty! ), Goliathus, Cyclommatus metallifer (Looking forwards to jumping into the Lucanids in general), and probably getting back into some Dynastes as well. For us, we need a good balance of display animals that are bright and colorful, or have interesting behaviors, and education animals that are touchable, kind of slow, and pretty sturdy. Open to any cool suggestions too!